Fun and fundraising will go hand in hand on Tuesday, August 2nd as the Five Towns will be welcoming Our Place for one of the most highly anticipated charitable events of the year. Endless barbecue, a dizzying selection of fine wines, a premium cigar bar and a virtual cornucopia of sushi will be just part of the attraction, with a competitive volleyball tournament that will have onlookers cheering for their favorites all through the night taking center stage at the event. 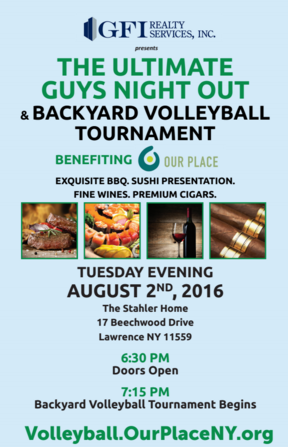 The Ultimate Guys Night Out & Backyard Volleyball Tournament, presented by GFI Realty, will be kicking off rain or shine off at 6:30 PM at the home of Ushi & Esti Stahler in Lawrence. More than just an exciting evening with incredible food, the event is expected to draw almost 400 attendees and will raise much needed funds for Our Place, which provides a wide range of services for troubled teens including drop in centers, a 24 hour hotline, 12 step support groups, rehabilitative services and vocational and educational placements. As in previous years, the talent continues to increase and competition at the tournament is expected to be stronger than ever, explained event chairman, Asher Jungreis, with 17 participating teams joining from not only the Five Towns, but also, Manhattan, Lakewood, Queens, Brooklyn, Teaneck & Riverdale. “We are truly attracting top Jewish athletes from throughout the tri-state area,” Jungreis added. Sponsors for the evening include GFI Realty Services, American Dream, MYDA Advisors, The Triple Net Group, Meridian Capital Group, Cash For My Miles, Maidenbaum Property Tax Reduction Group, the Valberg family, Gourmet Glatt, SeniorCare EMS, RME Group, Chase Abstract, the Taub family, Eden Wok New Rochelle, Junee, Franklin Group, Jet911, The Melohn Group, Junee Jr., Rosenberg and Steinmetz PC, Transport Luxury Auto, Herzog Wine Cellars and Marzipan. For more information or to register visit Our Place online at www.volleyball.OurPlaceNY.org or contact Rabbi Young at 516-512-4494 or aryeh.young@gmail.com. Has anyone in the holy 5towns given any thought to the fact that the gluttonous consumption of meat and wine (and cigars and sushi) that’s being offered at this event might be a huge contributing factor in the “teens at risk” problem in the 5towns? If you think I’m wrong, I suggest you consult the 8th perek of sanhedrin for a primer on contributing causes to at risk teens. Just sayin’.